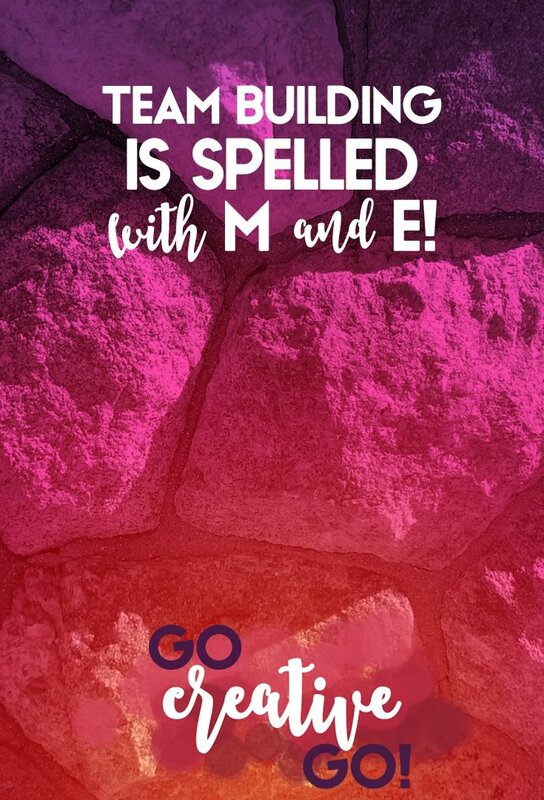 Team Building: Team Does Have The Letters M and E - Go Creative Go! Whenever it comes to team building for your small business or project, there’s a tendency to forget that teams are made up of individuals. But, what happens when you realize that the phrase is just another blanket statement? If you’ve known me for even a few days, you know I like to pick apart blanket statements. I’ve spent a lot of time working on collaborative efforts and creating strategic partnerships in order to bring my clients the best solutions, and I’ve learned a thing or three along the way. I know that there absolutely has to be at least one “i” in a team in order to keep things running smoothly. There’s a me on every team who has to step up to the task. Without someone taking on the role of team-leader, projects can meander and fall prey to a marketer or designer’s worst nightmare, the dreaded scope creep. On every design project, each time I help someone visualize their brand and connect with their unique messaging and style, I have to ensure that I provide value and keep the project viable. I’m not just a designer playing with color schemes and typefaces. I’ve got to be the project manager. Sometimes I have to dole out some tough love and prompt action when things start to slow down. This tough love often has to be delivered to the client themselves, not just subcontractors working on the project with me. Yes, you read that last sentence correctly. Someone on the team, at some time, will have to deliver tough love to the paying client when same paying client is the cause of the project going off track. When the client dilly-dallys, the project stalls. When the client doesn’t deliver content, the website can’t go live. When the client can’t settle on a color scheme, the project can’t move forward. If you let that happen, you’re not a very good project manager and you’re going to threaten the timelines and deadlines of not just the current project, but possibly future projects that you won’t be able to start, because you’re still sorting out scope creep and missed deliverables. Someone MUST Man (or Woman) Up! Teamwork can create killer communications, creations and more. But teams must be lead. Without leadership a team exercise can quickly turn into a convoluted creative circle-jerk. Derailed projects mean delayed delivery and delayed dollars. Both can be a big bummer for your business. A killer customer experience can’t happen when a teams goes without leadership, project management and clear communication. A team leader ensures team building is done with the project in mind, and that project targets are tracked and ticked off the list. Someone must take on the role of the “i” of that team. What do you think? Can there be a positive, effective “i” or “ME” on your team?